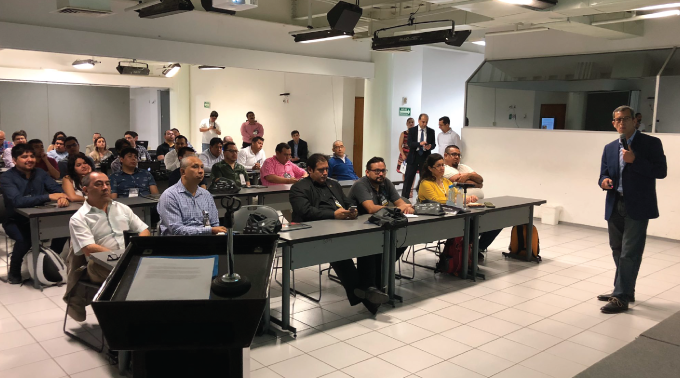 Together with Universidad Veracruzana de Mexico, the Mexican National Association of Universities and Higher Education Institutions and NIC Mexico, LACNIC WARP trained approximately forty Mexican professionals on how to handle computer security incidents and the creation of centers for managing and mitigating cybersecurity attacks. Over the course of three and a half days, LACNIC WARP experts led a workshop on the creation of security incident response teams in the city of Veracruz. The purpose of the activity was to promote information security specialists and encourage the dissemination of strategies for the development of collaborative networks for dealing with cybersecurity issues. As part of the workshop’s opening remarks, LACNIC CEO Oscar Robles stressed the importance of creating appropriate capabilities to respond to cybersecurity incidents, with special emphasis on how academia can contribute by deploying the IPv6 protocol. “IPv6 contributes to the traceability of online transactions, which in turn helps increase security,” noted Robles. Graciela Martínez, head of LACNIC WARP and the instructor responsible for the workshop, highlighted participants’ diversity (representatives of academia, public institutions, private companies, the technical community) and observed that this diversity had been reflected in the working groups that were created for the training activity. The workshop alternated theory and practical activities with the basics of creating a CSIRT and managing security incidents, and the different teams had to respond to simulated potential attack scenarios. “After they were organized, these groups had to respond to various incidents. Because of the participants’ diverse backgrounds, the workshop was also a way to create synergies among a community that is preparing to create incident handling teams,” Martínez observed. Giovanni Cruz, the instructor who presented the workshop together with Martínez, stressed the importance of working together. “Sharing a week with the workshop participants at Universidad Veracruzana was a very valuable and enriching experience,” he added. The workshop concluded with a round table where participants attempted to identify common projects and establish the basis for potential agreements regarding the creation of CSIRTs in Mexican universities or other institutions. The next workshop on cybersecurity incident handling is scheduled to be presented in Argentina towards the end of May.